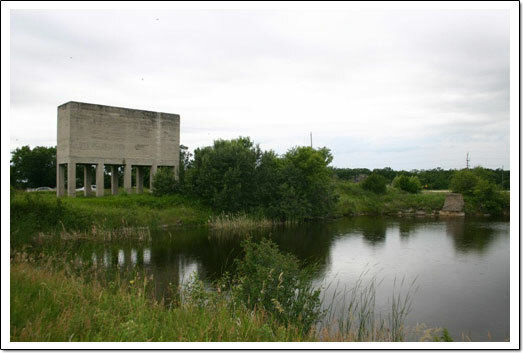 The large Oak Point Quarry, incorporating an excavation pit, massive concrete storage structure and kiln remnants, evokes an important period in Manitoba’s industrial heritage and in the history of the Interlake region. A local abundance of limestone led entrepreneurs at the turn of the twentieth century to establish many Interlake quarries to supply a booming building industry with raw material and manufactured lime, an ingredient in products such as mortar, plaster and cement. The Oak Point Quarry specialized in making slaked lime through a burning process that entailed use of 23-metre-high wood-fired kilns loaded with crushed stone by crane from the top. This complex, served by a Canadian Northern Railway spur, also held a huge concrete storage structure, the remains of which are now visually dominant, and various ancillary facilities and equipment. Established in 1912 by The David Bowman Coal and Supply Co. of Winnipeg, the quarry provided needed local employment for a decade before contraction of the building industry led to its closure.